Donnie Yen (甄子丹) announced on social media today that Ip Man 4 <葉問4> has completed filming its scenes in China. Currently busy with the post-production work for his films, Big Brother <大師兄> and Enter the Fat Dragon <肥龍過江>, Donnie could not celebrate with the Ip Man 4 cast and crew. The Ip Man franchise pushed Donnie’s career to new heights and was wildly successful at the box office. Ip Man 3 was the most successful in the franchise, earning a total of $769 million RMB in total box office receipts. In 2016, Donnie had hinted that a fourth installment would be in the works, but the project did not film until two years later due to his busy schedule. Director Wilson Yip (葉偉信) and action choreographer Yuen Wo Ping (袁和平) return to helm Ip Man 4. New cast members include British actor, Scott Akins, and Taiwanese actor, Vanness Wu (吳建豪), and a special appearance featuring Jackie Chan (成龍). The story for the new film follows Ip Man’s disciple, Bruce Lee, arriving in the United States to open his own martial arts school. Bruce offends the local people and Ip Man appears in Chinatown to help Bruce establish a stronger foot in Chinatown and win over his adversaries. Showcasing the power and spirit of Wing Chun, Ip Man earns the respect of the locals. The film will also depict how kung fu grows its roots in the United States. 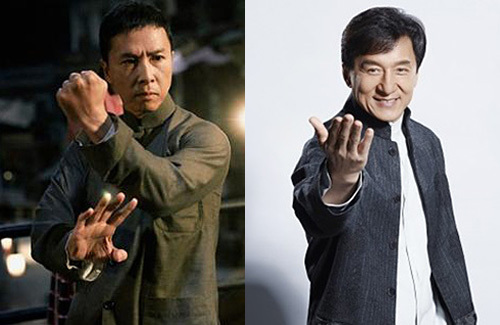 Portraying a respected Big Brother in Chinatown, Jackie Chan will have a fight sequence with Donnie Yen in Ip Man 4. While both are big martial arts stars, they did not collaborate on many films together before. This scene will be the biggest highlight in Ip Man 4. As to the actor portraying Bruce Lee, Pegasus Motion Pictures kept the casting under wraps and has not made an announcement. Shanghai Knights is the only one to my knowledge. Westerners absolutely adore Jackie Chan. If you bring up his adultery and how he treats his illegitimate children, they still defend him. Maybe it is more common in the their culture to do those things. What has this got to do with “Ip Man 4” Completes Filming; Donnie Yen to Fight Jackie Chan? @mike I am going to watch Ip Man only because of Donnie Yen. I never was a fan of Jerky Chan but found his movies entertaining. In the past several years, I’ve stop watching anything he stars in. Maybe I will wait till it is online. A bit off topic. North America has its fans who also think that the actors are just like the upright, decent, innocent good guy, good girl characters they portray in real life. If only they knew the disgusting slime rat that Jacky chan is. @mike Like it or not, Hollywood is far more open to adultery and bearing illegitimate children than China. Most tabloids don’t even care to report it as its a dime a dozen. Ï@mike There are lots of Hollywood celebs committed adultery or a horrible person/spouse/parent and they’re still being adored by their fans. JC is definitely not the first “scum” and still survives in the limelight. Whatever happens to his estranged about to be homeless daughter cry for help over youtube?? @jjwong Completely agree! One of the biggest complaints about the HK entertainment industry is the lack of capable artists to carry the torch from older generations. Unfortunately there are many older generation in the industry that exacerbate the problem by not supporting the effort to cultivate newcomers so that they become capable of carrying on the industry’s legacy in the future. Jackie Chan is one of the biggest examples of this (there are more but since this article is about him, will use him as example). He has his own production company and frequently serves as executive producer / producer of movies, but the problem is all of those movies have himself at the center. Like his upcoming grand production Hollywood-China-Hong Kong collaboration Project X, which he is producing and starring in alongside wrestler John Cena, with directing duties helmed by big name director Scott Waugh — at the press con at the Shanghai Film Festival where they introduced the movie, there was so much talk about Jackie’s wealth of experience in the industry and how this movie will be spectacular in terms of stunts and action sequences due to the “trifecta” of JC, Cena, and Waugh, emphasis on how the teams working on the production from all sides are super-experienced, etc etc. A film like that would’ve been perfect opportunity to bring newcomers into the mix and cultivate them, train them, mentor them, etc….instead, it’s all about Jackie and the fact that he still does his own stunts at like 60 years old (I made up that number, as too lazy to go look up his age) and he along with his super experienced stunt team will choreograph all the fight scenes, etc etc. I mean, even his “big brother” Sammo Hung understands what it means to mentor the newer generation (which is exactly what he did with Chin Kar Lok, his protégée who is now an award-winning action choreographer in his own right with his own stunt team). Sure, people can argue that older artists have no obligation to help cultivate future generations, which may be true, but then that says a lot about those artists and whether they are in it for the fame and fortune…those who truly care about their craft and don’t want to see it die out are those who will be more willing to take on the mentor role and encourage future generations to rise up. @llwy12 That’s very very unfortunate. The irony is how we keep feeling nostalgic and referencing back to the golden days where all these now-super-stars entertained us. And how opened and willing they were learning from the previous gen. Then we scolded the young gen of today not be so open and learn, but in reality how many golden years people are willing to teach and pass the torch? I flew internationally between Asian countries a lot for past few years. 90% of the Asian movies starred these golden years actors. Andy Lau starred 4 movies out of 15 or 18 ! I have yet flown one time without having a new Andy film on the list, lol. @jjwong Don’t get me wrong — there are quite a few who are willing and have taken it upon themselves to cultivate next generation. In the movie industry, legendary director Johnnie To and scriptwriter Wai Ka Fai are two examples — in fact, the two of them opened a a production company together whose entire purpose was to cultivate a new generation of filmmakers to carry the torch. And it has paid off — look at the HKFA Best Picture winner from 2 years go, the movie Trivisa, which was one of the movies that came out of the mentor ship program that the two of them created. The movie was actually produced by Johnnie To and Yau Nai Hoi (who is one of Wai Kai Fai’s mentees and a long-time collaborator with the two) but yet they took very little credit for the movie, instead pushing all the credit over to the 3 young directors who helmed the production. I read an interview the 3 directors did and they had said that they learned a lot from both producers, though both chose to mentor behind the scenes in a more support/consulting role so the young directors could be independent but still go to them for support if needed. And of course, it paid off, not just because the movie won many awards, but also because it won much critical acclaim and praise across the board (except in China of course where the movie was banned for political reasons and also because it painted China/CCP in a bad light). I see Andy Lau in a similar light to Jackie in that he primarily makes movies with himself at the center, though in recent years he’s done a better job in terms of investing in projects that don’t feature himself (3 recent examples I can think of are: the movie The Gallants, which was produced by Gordon Lam but funded by Andy; the Fox Asia TV series Trading Floor, which he was billed as producer; and a stage play that Anthony Wong starred in, which I don’t remember the name of at the moment). Now of course Andy investing money in other projects definitely doesn’t count the same as say Johnnie To investing time and energy (as well as money) into training the next generation, but the way I see it, Andy at least making the effort to move the focus of his movies away from himself is definitely a step in the right direction (and more than what Jackie Chan has done in this area). @llwy12 Agree. I don’t mean to put out an impression that no one from golden years are help younger gen either. It just doesn’t seem to be enough since the gold year gen still dominates headlines and movies. Maybe it is too early to tell/replace. True that it’s good Andy Lau is at least investing. Gordon and Anthony aren’t the young gen though… Sam Ho promoted CKL at least a decade ago. Then again it’s better late than never. Speaking of which, is Gordon consider yo be Andy’s protégé just as CKL is Sam’s?